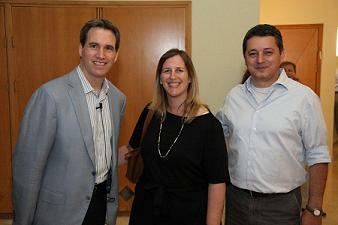 On May 22, 2012, 100 people came out to hear Harvard Law School grad and world renowned business consultant and author Dov Seidman talk about his ideas for how to do business in our changing world. The Harvard Club of Israel co-hosted the evening with the Interdisciplinary Center of Herzliya (Israel's first private institution for higher education). Dov Seidman, CEO of LRN, expanded on his idea that " Our world is being dramatically reshaped. The rules of the past no longer apply. In the 21st century, it's no longer what you do that matters most but how you do it." In other words, it is not just the revenue, market share or profit margin numbers that matter, but the way you govern your company from the inside and outside in the world. There are more than 1000 Harvard Alumni in Israel, including professors at all of the universities and several members of the Knesset (Israel's parliament), armed forces officers and business leaders.